The Moon appears large because it is seen close to the horizon and our perception is deceived by the proximity of references on the ground. In this space wallpaper, the Moon appears large because it is seen close to the horizon and our perception is deceived by the proximity of references on the ground. In order to get this spectacular close view, a 500-mm lens was necessary. The very long focal length reduces the depth of field making the objects in focus appear as if they were at the same distance. 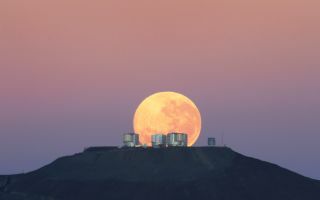 ESO staff member Gordon Gillet welcomed the new day by capturing this stunning image from 14 km away, on the road to the nearby Cerro Armazones, the peak recently chosen by the ESO Council as the preferred location for the planned 40-metre-class European Extremely Large Telescope (E-ELT).This effect, combined with the extraordinary quality of this picture, gives the impression that the Moon lies on the VLT platform, just behind the telescopes, even though it is in fact about 30 000 times further away.